Every morning at The University of Texas at El Paso will be greeted by a Mandala Sunrise, the new piece of public art in the roundabout at the intersection of Glory Road and Sun Bowl Drive. The artwork, which measures 32 feet in diameter and 24 feet at its highest point, was designed by Koryn Rolstad, an award-winning artist based in Washington state. 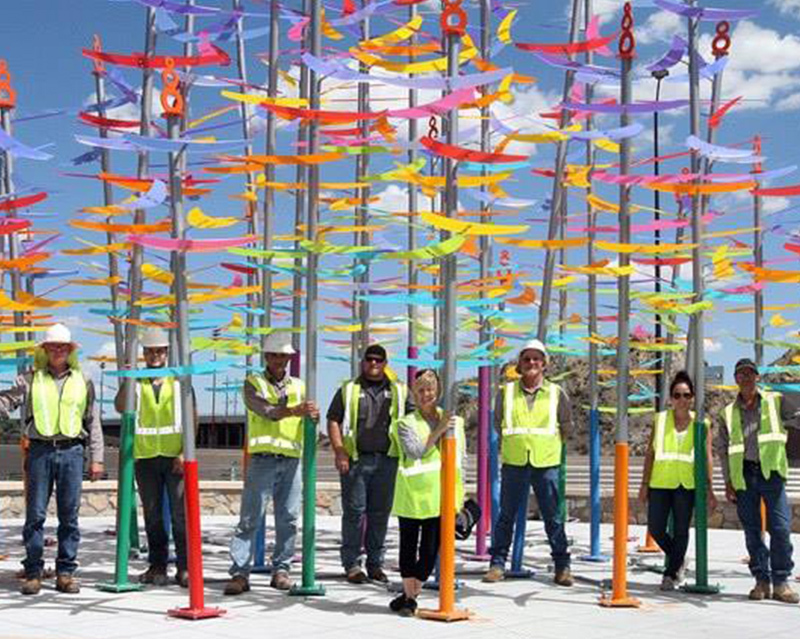 It is made up of a collection of powder coated aluminum poles of different lengths topped with colorful translucent crescent-shaped resin substrate “wings.” The bottom of each pole is brightly colored. The artwork, which resembles Bhutanese ceremonial ﬂags blowing in the breeze,celebrates the special relationship between UTEP and the Kingdom of Bhutan that has grown since the initial decision by campus leaders almost 100 years ago to borrow the architectural style of the Himalayan country. The artist visited the University last spring to get a sense of the location. As a result, she designed a piece of art that combines nature and culture. The sun shines through the translucent wings during the day and multicolored in-ground LED lights take over at night. Rolstad has a background in architecture, engineering and ﬁne arts, and her public art can be seen around the world. Through her almost 40 years of work, she has developed a style that emphasizes environmental forms that explore materials, technologies and imagery. While the design is elegant and simple, it also is structurally sound. The artist said the highly engineered yet lyrical installation can handle 110 mph winds. 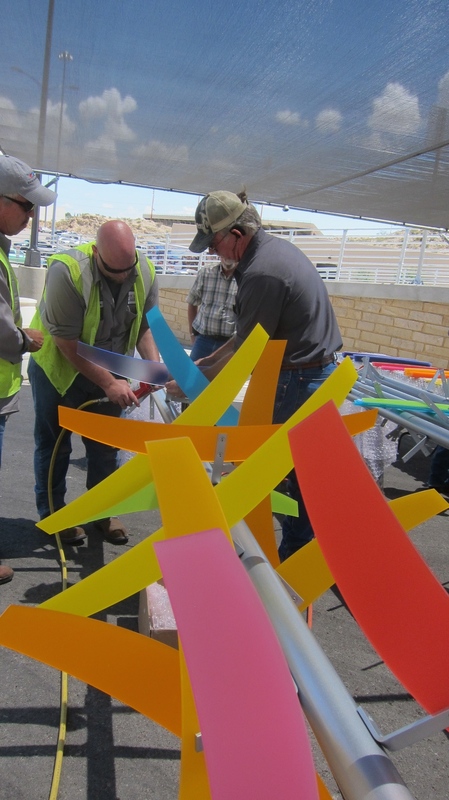 The public art piece is part of a successful collaboration between UTEP and the Texas Department of Transportation that included a $4.8 million Sun Bowl Drive expansion project. 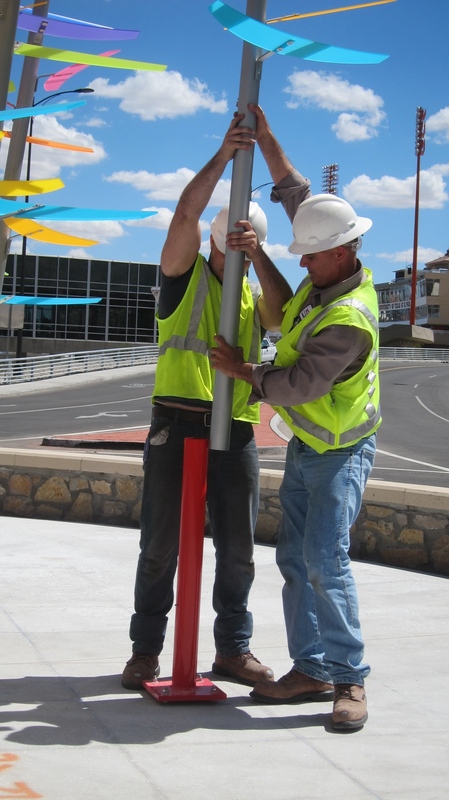 The project widened Sun Bowl with an additional lane in both directions from just south of the Don Haskins Center to just north of the Sun Bowl Parking Garage. The work, which started in September 2013, also included sidewalks, enhanced lighting, and 14-foot wide outer lanes to accommodate bicyclists. The University’s public art committee selected Rolstad’s proposal from several submitted. The selection was based on the artist’s interest, qualiﬁcations, project narrative, fabrication and production, previous commissioning agencies and organizations, and project timeline.